Five weeks into the semester, and it feels like its been months. I’m just slogging through it, social excursions at a minimum. I finally snuck out to see Little Miss Sunshine on Sunday and felt like a rebel. This past weekend was particularly tough, as I needed to read and note feedback on 18 student papers for conferences this week in addition to all the reading, translations and writing that were due. Wednesdays are usually a bit of a catch-up day, but tomorrow I am going to an all-day Old English Workshop. There are some dudes from England coming to lecture on such things as problems with translation, and illuminated manuscripts. I’m not really sure what it’s all about really. I’m hoping there will be some arts and crafts…like “Make Your Own Illuminated Manuscript—the Graphic Novel of the Anglo Saxons!” But I fear they probably don’t do arts and crafts at Research One universities. It’s also a big week for my writing, as I had the first part of a fiction piece up for critique in class last night, and we’ll be work-shopping an essay tomorrow afternoon as well. The fiction piece went over well, as the teacher liked it, and allowed it to “pass”…which means that I get to write the next section for our next workshop instead of throwing it away and starting something new, which is standard. There is a certain amount of pressure that goes along with this, because I guess he can revoke his opinion upon seeing the next section if it doesn’t live up to the first one. Stay tuned for further exciting updates on that. Here is something truly exciting: I’ve found a miracle cleanser! Living in run-down student housing that hasn’t been upgraded since the early seventies means that sinks, tubs etc, essentially look like crap. I’ve tried various cleansers, along with straight bleach and hot water, with only limited success. The other day though, a bottle that was balanced on the soap rack tipped over and dripped into the tub. When I looked, I noticed that the trail left by the substance was a brilliant white! I called Paul upstairs to look, jumping up and down, saying, “That’s what our tub looks like underneath!” To test our hypothesis we poured more of the substance over other parts of the tub and let it sit. The next day we scrubbed it off (it didn’t take much scrubbing either) and Voila! It was beautiful to behold. And smelled nice too. What’s the magic potion? 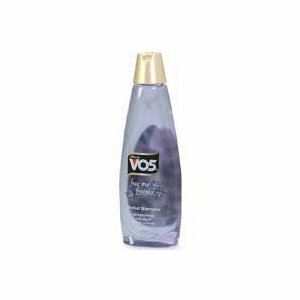 Alberto V.O.5 Free Me Freesia Shampoo. I’ve started using to clean the toilet and sinks as well. I’m incredibly happy, although a little scared of what it might happening when I actually put in on my scalp. If you try it, let me know what you think. Previous Previous post: Refreshing Young Advertisers?